Hundreds of activities are taking place across the UK on Friday 7, Saturday 8 and Sunday 9 April 2017 aimed at getting everyone to try something new and creative. A mass-participation dance up one of Wales' highest mountains kick-started this year's Get Creative Weekend - a bumper three-day fiesta of arts, crafts and creativity. Pottery studios across the UK are throwing open their doors for Hey Clay!, giving would be potters a chance to get fired up behind a pottery wheel, while other highlights include steam-bending furniture making in Manchester, learning circus skills in Northern Ireland, an interactive workshop mixing Shakespeare and dance in Dundee, and an audio tour of historic King's Cross in London to name just a few. The 650 events - many of them free - are being held by arts organisations big and small including the British Museum, Derby Theatre and a host of others from Orkney to Cornwall, Brecon to Belfast. Coverage of Get Creative Weekend from around the country plus watch our dance, painting and quilting masterclasses. How to draw faces, hands and getting started with painting. Watch our masterclass. Award-winning dance and installation artist Phil Williams transformed the dramatic peaks of Pen Y Fan into a living art installation called Heart of Wales on Friday April 7. Teams of volunteers from across the country got involved in the project, which was masterminded by Theatr Brycheiniog with Brecon Beacons National Park, The National Trust, BBC Wales and Arts Council of Wales. 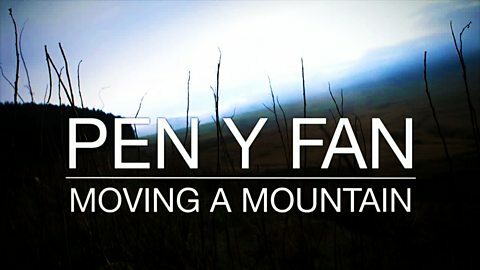 The dance up Pen Y Fan is just one of 200 events in Wales. On Sunday, Cardiff Pottery will be holding free taster sessions, these will include both hand-building and throwing while award winning artist and illustrator Beth Giles is using found and abandoned objects to create mark making tools and paint brushes to create an abstract acrylic paint and ink landscape in Pontyclun. There are also a host of free exhibitions from Anglesey to Aberystwyth. Find out what's happening in Wales by clicking on this interactive map. Want to witness the drama of raku firing and have a go at throwing on a wheel, pinching, slab building, coiling and much more? Among the exciting Hey Clay! events across the country you can create pinch pot egg cups in West Yorkshire, make a clay figure at the Leach Pottery in Cornwall, create terracotta pots at Ruthin Craft Centre in Wales or have a go on a wheel in Bristol’s mobile pottery studio. Plus the home of the Great Pottery Throw Down – Middleport Pottery - host a whole weekend of fun activities. “Hey Clay! is a fantastic opportunity to roll up your sleeves and have fun with clay - the most responsive of materials," said Kate Malone, ceramic artist and judge on The Great Pottery Throw Down. 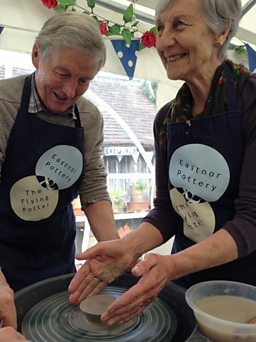 Find a pottery studio taking part near you. How many weather forecasters does it take to make an origami bunny? In Northern Ireland, there were Creatathons in Belfast and at various locations in Londonderry. There were demonstrations of patchwork techniques as well as storytelling and South Asian dance, amongst others, at Ulster Museum in the capital. 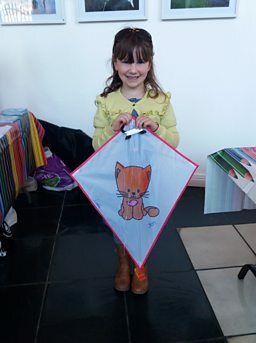 While there was kite-making, flamenco dance classes and circus skills to juggle in Derry. Events were also held in Ballymoney, Portstewart and Bangor. * A day of singing, theatre, painting, crafts, printmaking, dancing, textiles and circus at the West Dean Parish Centre in the Forest of Dean. Activities are not organised by the BBC and parents should check that events are family friendly. 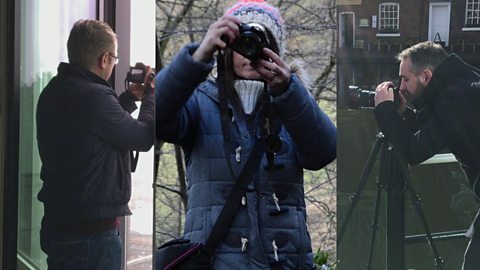 We asked three England's Big Picture photographers for their advice. There are hundreds of creative workshops and taster sessions being held around the UK from origami to jewellery making. If you're in England, Northern Ireland or Scotland use this interactive map from Voluntary Arts to find your nearest event, and if you're in Wales use this one. Activities are not organised by the BBC. Neither is the BBC responsible for the accuracy of the information provided. If you are under 18, ask your parent/guardian before taking part in any activity. If you have always wanted to learn more about patchwork and quilting then Get Creative Weekend has got you covered. 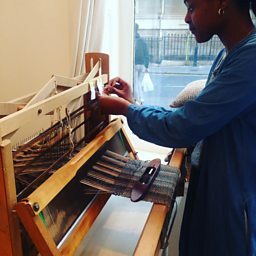 The Quilters' Guild of Great Britain is working with a variety of BBC local radio stations across England to run taster sessions and workshops in libraries. The Quilters’ Guild is the national organisation for people involved in patchwork and quilting, whether you are a beginner, an experienced quilter or someone interested in the history and development of patchwork and quilting find out more at these fun and informative sessions. Details of where to find the events will follow. Full details about the glorious celebration of creativity across the United Kingdom. Share your creativity with the world! Do you paint, dance, knit or sing? Then grab your phone and film yourself doing your hobby. Go hopping mad for origami! And watch three BBC weather forecasters take on the folded paper rabbit challenge. What to learn more about about quilting? We’ve got you covered!